Down in Key West, the months of July through October face the looming possibility of a hurricane hit. In 2008, we did not get any full-on direct hits, but we did feel the effects of two major storms. The Dry Tortugas are a tiny chain of islands about 70 miles off the coast of Key West. Sometimes the storms can hit the small chain even worse than it does on the island of Key West. The last major directly hit to the Dry Tortugas was Hurricane Charley, which was also the 5th costliest storm to make U.S. landfall. After crossing over Cuba, the storm came almost directly to the Dry Tortugas. 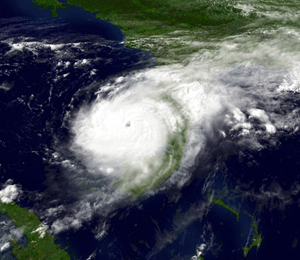 Hurricane Charley was a Category 4 hurricane with sustained winds of up to 150 miles per hour. The total cost in damage of the hurricane is estimated at $16.3 billion. There were a total of ten deaths that were a direct result of the hurricane. This was the strongest and costliest hurricane to hit the southwest region of Florida in 1960 with Hurricane Donna. In the Dry Tortugas, the storm caused a storm surge of up to 6 feet. Along with a bunch of incoming waves, the storm surge caused awful flooding in the Dry Tortugas, particularly on Garden Key where Fort Jefferson is located. The surge and the flooding damaged the first layer of bricks that surround the fort's moat wall as well as damaging two boat docks. Before the storm, there was a natural land bridge that connected Garden Key and Bush Key (where the sooty terns come to nest between March and September), but that was washed away during the storm. But like other places that have been damaged by hurricanes, the locals and regulars came to the rescue. People from Key West as well as Dry Tortugas lovers and national parks enthusiasts rushed to help bring the islands back to their condition before Hurricane Charley. There was a special fund set up for the Dry Tortugas that was meant to be used in emergency situations like this one. For a few weeks, the Dry Tortugas had to cease their regular operations and all workers and a few volunteers worked daily to help bring the islands and the fort back to normal. Today, the effects are not noticeable and the 2008 hurricane season has come and gone with only the most minor of effects on the Dry Tortugas.